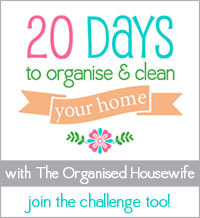 Well, can I say that I'm a little behind on my "20 Days to Organise & Clean Your Home" challenge? playing with her and the heck with laundry and housework. Yesterday afternoon, I decided it was time to tackle the challenge for Day 1, cleaning the kitchen and more importantly - under the kitchen sink. Things were out of control under the kitchen sink, the cleaners didn't fit and were being thrown in and it was getting hard to find what we needed. And things were pushed into the back because there was an open spot. First up was to pull everything out so I could start with a blank slate. The bottom was very grimy and neededto be cleaned really bad. This was an area that I knew needed some help but kept putting it off. leaked out and damaged the wood. I could paint it but decided it was just easier to cover it up. I took one of the plastic tubs that was already being used under the sink and went through all the cleaners. We had several containers of carpet cleaners, almost empty bottles of floor cleaners, bug spray, dishwasher tablets - all taking up lots of room. And this is what was deemed essential cleaning products. I got rid of the vegetable brushes, I don't think I've scrubbed a vegetable in years. the dishwashing tablets..afterwards I thought it was ironic that the tablets have yellow/orange in them so it does kind of look cute! The green basket came from The Dollar Tree and is holding my cleaning kit. and I'm sure that over time, the products will change. I love the Mr Clean erasers. I even use them to clean my white kitchen sink! My new favorite cleaning product is - Norwex cleaning towels for the windows. No more window cleaner and no streaks..love it! it was so messy and I didn't really want to store them under the sink once I got it. I pulled out my stash of microfiber washcloths and added them to the top bin. there are crumbs on the floor. Love how I can get to it but it's also not in the way! really messy and hard to find things quickly. latest project...and he thought it was so much better! Stay tune for Day 2 Challenge. Looks so much better. I was going to tell you that we just redid the space under our sink. We used those peel and stick vinyl tiles to basically refinish the underneath where there had been a some water damage. It was cheap and looked so much better. Wow - it looks amazing! Fantastic. I don't know about you, but now that I've got these small pockets organised, I feel like I can clean anything! Great doing the challenge with you! Hope you go well with the rest of it.